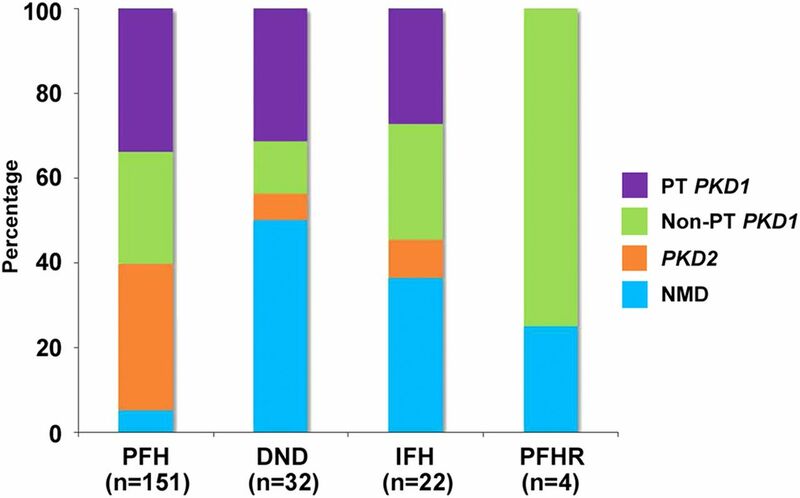 The absence of a positive family history (PFH) in 10%–25% of patients poses a diagnostic challenge for autosomal dominant polycystic kidney disease (ADPKD). In the Toronto Genetic Epidemiology Study of Polycystic Kidney Disease, 210 affected probands underwent renal function testing, abdominal imaging, and comprehensive PKD1 and PKD2 mutation screening. From this cohort, we reviewed all patients with and without an apparent family history, examined their parental medical records, and performed renal imaging in all available parents of unknown disease status. Subsequent reclassification of 209 analyzed patients revealed 72.2% (151 of 209) with a PFH, 15.3% (32 of 209) with de novo disease, 10.5% (22 of 209) with an indeterminate family history, and 1.9% (four of 209) with PFH in retrospect. Among the patients with de novo cases, we found two families with germline mosaicism and one family with somatic mosaicism. Additionally, analysis of renal imaging revealed that 16.3% (34 of 209) of patients displayed atypical PKD, most of which followed one of three patterns: asymmetric or focal PKD with PFH and an identified PKD1 or PKD2 mutation (15 of 34), asymmetric and de novo PKD with proven or suspected somatic mosaicism (seven of 34), or focal PKD without any identifiable PKD1 or PKD2 mutation (eight of 34). In conclusion, PKD without an apparent family history may be due to de novo disease, missing parental medical records, germline or somatic mosaicism, or mild disease from hypomorphic PKD1 and PKD2 mutations. 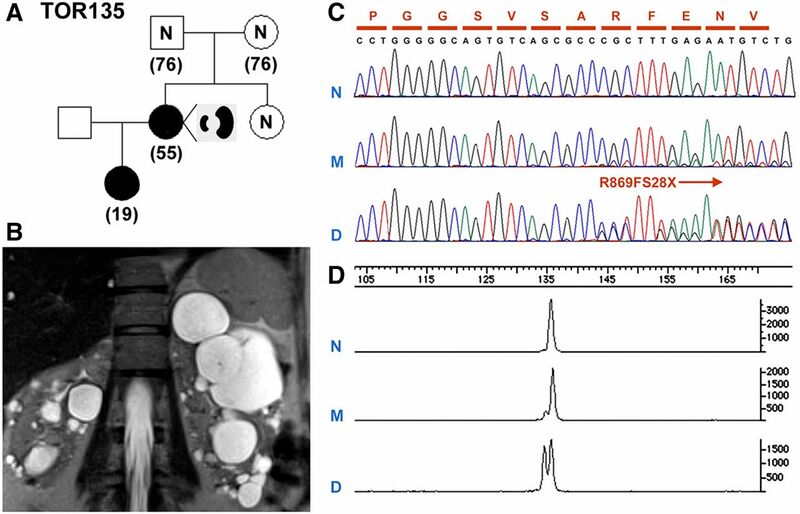 Furthermore, mutations of a newly identified gene for ADPKD, GANAB, and somatic mosaicism need to be considered in the mutation-negative patients with focal disease. The diagnosis of ADPKD is most commonly established by ultrasonography, which is readily available and inexpensive.7 In equivocal patients or young at-risk subjects, magnetic resonance imaging (MRI) may also be used.8 For these imaging modalities, validated age-dependent diagnostic criteria have been established for diagnosis and disease exclusion; however, both required a positive family history of ADPKD. This is because the pretest probability of an at-risk subject (who has a positive family history) at birth is 50%. By contrast, in the absence of a positive family history, the pretest probability of ADPKD is that of the population risk (i.e., one in 500–1000).7,8 Thus, the absence of a positive family history poses a diagnostic challenge in 10%–25% of patients suspected of ADPKD. In a recent series of 24 patients suspected to have ADPKD without an apparent family history, six (25%) were found to have de novo pathogenic PKD1 mutations, three (12.5%) were found to have a positive family history in retrospect with pathogenic PKD1 mutations, and the remaining (15% or 62.5%) had no mutations detected in both PKD1 and PKD2.9 In the TGESP,5 210 affected probands underwent renal function testing, abdominal imaging, and comprehensive PKD1 and PKD2 mutation screening. From this cohort, we reviewed all patients with and without apparent family history, examined their parental medical records, and performed renal imaging in all available parents of unknown disease status. Here, we report a systematic study on the prevalence and causes as well as the renal imaging correlates of patients without an apparent family history of ADPKD. Figure 1 shows the distribution of PKD1 and PKD2 mutation classes in patients with different family history classification. Compared with those with a positive family history, in whom 95.3% (144 of 151, including one patient identified on rescreening; see below) had an identifiable PKD1 or PKD2 mutation, the mutation detection rate in patients with de novo disease and indeterminate family history was significantly lower at 55.5% (30 of 54; odds ratio, 0.06; 95% confidence interval [95% CI], 0.02 to 0.15; P<0.001 by Fisher exact test) (Figure 1, Supplemental Table 1). However, compared with those with a positive family history (i.e., 63.8% or 92 of 144), patients with de novo disease and an indeterminate family history (i.e., 86.6% or 26 of 30) had a higher proportion of PKD1 versus PKD2 mutations (odds ratio, 3.7; 95% CI, 1.2 to 11.1; P=0.02 by Fisher exact test). Although patients with a positive family history in retrospect also exhibited a high proportion of PKD1 mutations (75% or three of four and all nontruncating), the number is very small. The distribution of mutation classes in study patients differs according to their family history classification. DND, de novo disease; IFH, indeterminate family history; NMD, no mutations detected; non-PT PKD1, nontruncating PKD1 mutations; PFH, positive family history; PFHR, positive family history in retrospect; PKD2, PKD2 mutations; PT PKD1, protein-truncating PKD1 mutations. Figure 2 shows a flow diagram of our renal imaging study in the TGESP cohort. To delineate the relationship of atypical (i.e., asymmetric, unilateral, or focal) (Concise Methods) PKD with the different family history classification, an experienced abdominal radiologist (K.K.) reviewed the renal imaging (160 on the basis of computed tomography [CT] or MRI scans and 50 by ultrasound) patterns of all study patients without any knowledge of their clinical or genetic status. The renal images of one patient with congenital single kidney were not analyzed. Of 160 patients with CT or MRI scans reviewed, 30 met the criteria for atypical PKD: 22 with asymmetric disease, seven with focal disease, and one with unilateral disease. Of 49 patients with renal ultrasound reviewed, four met the criteria for atypical PKD: one with asymmetric disease and three with focal disease. In total, 16.3% (34 of 209) of our study patients had atypical PKD by renal imaging, and their clinical and genetic correlates are shown in Table 2. Most of these patients with atypical cases followed one of three patterns: asymmetric or focal PKD with positive family history and an identified PKD1 or PKD2 mutation (15 of 34), asymmetric and de novo PKD with proven or suspected somatic mosaicism (seven of 34), or focal PKD without any identifiable PKD1 or PKD2 mutation (eight of 34). Of note, the percentage of patients with an identifiable PKD1 or PKD2 mutation was significantly higher among those with typical compared with atypical PKD (i.e., 91.4% or 160 of 175 versus 58.8% or 20 of 34; P value <0.001 by Fisher exact test). Among those with atypical PKD, 20 had a positive family history, in whom 84.2% (16 of 20) were mutation positive; eight had de novo disease, in whom 37.5% (three of eight) were mutation positive; and six had an indeterminate family history, in whom 16.6% (one of six) were mutation positive. Thus, the presence of a positive family history or typical renal imaging pattern is associated with a high mutation detection rate for ADPKD. Examples of asymmetric and focal PKD are shown in Figures 3 and 4, respectively. The clinical characteristics of patients with asymmetric PKD are detailed in Supplemental Table 2. One mutation-negative patient with a highly unusual pattern of unilateral PKD is shown in Figure 4, C and D.
Flowchart of systematic imaging review of the TGESP cohort. The study subjects were classified into subgroups with a positive or apparently negative family history and typical or atypical PKD. Representative images of three patients with asymmetric PKD. (A and B) Coronal and axial enhanced CT images depicting almost complete replacement of an enlarged right kidney by numerous cysts. (C and D) Coronal and axial T2-weighted MRI images show normal-sized kidneys. Cystic disease is predominantly within the right kidney and liver. (E and F) Coronal and axial T2-weighted MRI images reveal an enlarged left kidney with numerous cysts. In each patient, the contralateral kidney contained significantly fewer cysts and was of normal size. 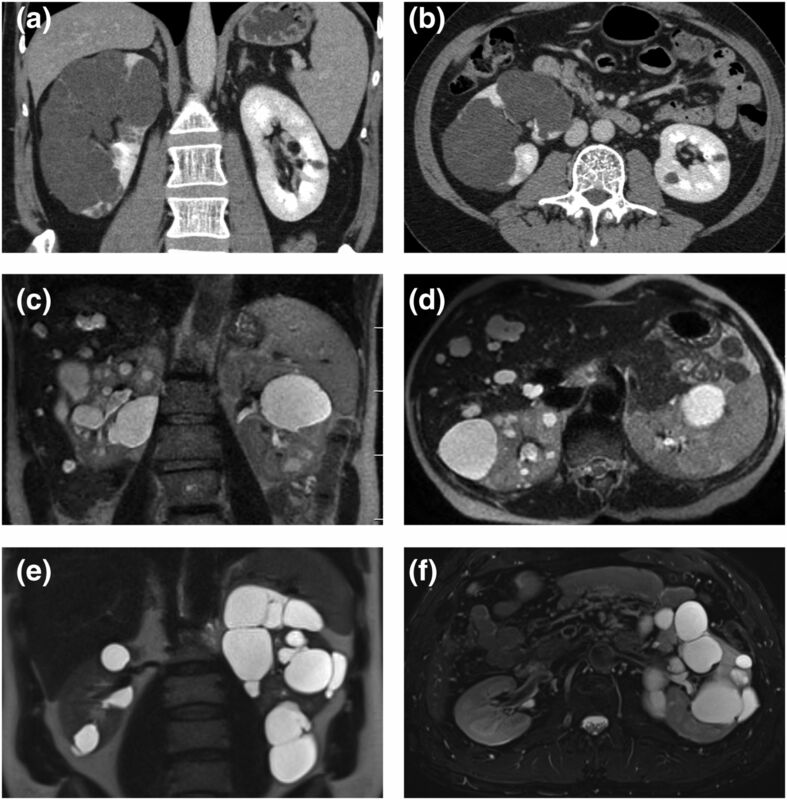 Examples of atypical PKD identified by renal imaging. Coronal MR images of three patients with (A and B) focal and (C) asymmetric PKD. (A) A 58-year-old man with a positive family history of kidney cysts in two brothers. He had multiple cysts (more than ten per kidney) bilaterally and enlarged kidneys from several large to very large cysts. His total kidney volume measured 3.63 L. He was screened negative for PKD1 and PKD2 mutations. (B) A 57-year-old man with negative family history of PKD presented with incidental findings of focal bilateral renal cysts (>20 cysts in each kidney) and normal kidney function. He was screened negative for PKD1 and PKD2 mutations. (C and D) Coronal and axial MR images of a 55 year old man with incidental findings of unilateral PKD (>50 cysts in his left kidney). He was mutation negative with an unconfirmed possible family history of renal cysts in his 83-year-old father. One half (16 of 32) of our patients with putative de novo PKD had an identifiable PKD1 or PKD2 mutation, and most (24 of 32) displayed a typical imaging pattern of ADPKD (Figure 1, Supplemental Tables 1 and 2). In eight of 16 mutation-positive patients, we confirmed their disease as de novo by paternity and mutation testing of their parents (data not shown); however, we were unable to confirm the de novo disease status of the remaining patients due to death or unavailability of one or both of their patients. Two mutation-negative patients with de novo disease presented with focal PKD (examples are in Figure 4, A and B, Table 2). Of the other mutation-negative patients, we found two families highly suspicious of germline mosaicism. In TOR186 (Figure 5A), we identified two affected siblings with unaffected parents. We detected a pathogenic PKD1 (c.7666C>T; p.Q2556X) mutation in both of them (II:3 and II:4) as well as the affected daughter of II:4 but not in their unaffected father (I:1). Their mother died of breast cancer at age 66 years old, with multiple negative renal ultrasound scans since 45 years old. Haplotype analysis (Supplemental Figure 1) shows that only one PKD1 haplotype (1-1-2-1-1) cosegregates with all three affected family members (II:3, II:4, and III:1). This haplotype originated from the unaffected father (I:1) and is also present in one unaffected (II:2) sibling. Taken together, these data strongly support the diagnosis of germline mosaicism in I:1. 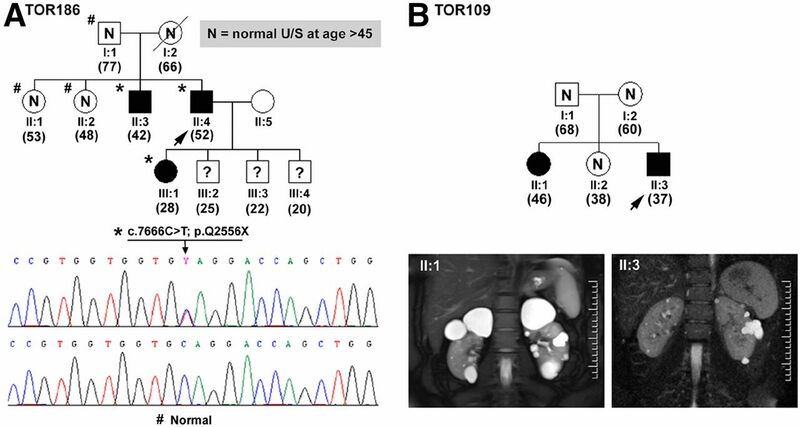 Similarly, our findings of two mildly affected siblings (II:1 and II:3) with unaffected parents (I:1 and I:2) in TOR109 (Figure 5B) also suggest germline mosaicism, although we did not detect a pathogenic PKD1 or PKD2 mutation in this family. Examples of germline mosaicism. (A) TOR186 is a pedigree with proven germline mosaicism. Two members (II:3 and II:4) inherited the same pathogenic PKD1 mutation (c.7666C>T; p.Q2556X) from their apparently unaffected parents. (B) TOR109 is a pedigree with suspected germline mosaicism with no detectable PKD1 or PKD2 mutation. U/S, ultrasound scan. We found that 18.8% (six of 32) of our patients with de novo disease have asymmetric PKD (Figure 3, Supplemental Table 2, Table 2). In one family (TOR135), the proband presented with asymmetric PKD with a measured creatinine clearance of 78 ml/min at age 53 years old; she also has an affected daughter with typical imaging pattern of ADPKD (Figure 6, A and B). At ages 53 and 18 years old, their height-adjusted total kidney volumes were 533 and 563 ml/m, respectively. Sanger sequencing identified an unambiguous PKD1 frameshift (c.2605delC; p.R869fs28X) mutation in the affected daughter, but the sequence at this position in our proband was suggestive of nonspecific background. However, quantitative PCR revealed that there were low levels of mutant alleles (i.e., approximately one mutant allele compared to every 10 normal alleles) in her leukocyte DNA (Figure 6, C and D). We further screened randomly selected clones of individual PCR amplicons encompassing the mutation site in the proband and her affected daughter. We found that 13.5% (42 of 311) of the PCR clones screened in the proband carried the PKD1 mutation. By contrast, 53.4% (174 of 326) of the clones screened in her daughter carried the PKD1 mutation (data not shown). Taken together, these data indicate that the proband is a PKD1 somatic mosaic with germline disease transmission to her daughter. Two of five remaining patients with de novo and asymmetric PKD had a PKD1 mutation, whereas the other three were mutation negative (Supplemental Table 2). An example of PKD1 somatic mosaicism. (A) A pedigree (TOR135) with somatic mosaicism and germline disease transmission. (B) MRI shows asymmetric PKD in the affected mother with somatic mosaicism. (C) Sanger sequencing showing a 1-bp PKD1 frameshift deletion (c.2605delC; p.R869FS28X) unequivocally in the daughter (D) but not in the mother (M). (D) Quantitative analysis by capillary electrophoresis of the PCR product encompassing the PKD1 mutation site shows that the ratio of mutant to normal alleles is approximately 1:1 in the daughter (D) but only approximately 1:10 the mother (M). Twenty-two patients had an indeterminate family history due to inaccessibility of the medical record of one or both of the parents as a result of parental death (n=17), adoption (n=3), or estrangement (n=2). Most of them (72.7% or 16 of 22) had an identifiable PKD1 or PKD2 mutation with a typical imaging pattern of ADPKD (Supplemental Table 1). Of the eight mutation-negative patients, five had asymmetric PKD (Table 2) suspicious of somatic mosaicism; none have any affected children. One other mutation-negative patient had focal PKD. Four patients had a positive family history in retrospect; all had very mild disease with typical imaging pattern of ADPKD (Table 1). Three of them had a nontruncating PKD1 mutation (Table 1, Supplemental Table 1), whereas in one, no mutation was detected. The PKD in their older relatives and affected parents was also very mild; all had normal or near-normal renal function (data not shown). We rescreened 32 mutation-negative patients by targeted resequencing using a gene panel that contains PKD1, PKD2, GANAB, and HNF1B. We identified a frameshift PKD1 mutation (c.5014_5015delAG; p.R1672fs97X; confirmed by Sanger sequencing on a locus-specific PKD1 template) in a patient with a positive family history previously screened by Athena Diagnostic. We also identified three missense GANAB variants (i.e., p.R331C, p.H872Y, and p.R54W) with pathogenic potential predicted by bioinformatics algorithms (Supplemental Table 3). R331C was considered likely neutral by a previous study on the basis of a functional assay, in which the expression of this mutant in GANAB-null cells restored surface localization of polycysin-1.6 H872Y was identified in the Exome Aggregation Consortium (ExAC) database 398 times, including four homozygotes, and is unlikely to be pathogenic. R54W has been reported in the ExAC database seven times and is not very well conserved; however, in the absence of functional analysis, we are unable to determine its pathogenicity at this time. No mutations (including large gene rearrangements) were identified in our HNF1B screen. PKD without an apparent family history can be due to very mild disease that is not initially recognized in the affected parent, which is exemplified by our patients with a positive family history in retrospect. Interestingly, three of four patients with a positive family history in retrospect were found to have nontruncating PKD1 mutations, many of which have been recently shown to be associated with mild disease.3–5,17,18 Similarly, patients with a positive family history in retrospect are affected due to very mild disease associated with PKD2 mutations as well.3–5 We also found that 13.4% (28 of 209) of our study cohort did not have an identifiable PKD1 or PKD2 mutation (Table 1). Excluding ten with asymmetric PKD suspected or proven to harbor somatic mosaicism, 8.6% (18 of 209) of our patients remain genetically unresolved. Most of the latter patients displayed mild or focal disease with a positive family history, suggestive of GANAB mutations.6 However, we did not identify any definitively pathogenic GANAB mutations. Thus, the genetic causes in these patients remain unsolved but could be due to missed PKD1/PKD2 mutations (e.g., intronic or synonymous exonic mutations that cause atypical splicing) and/or additional GANAB-like gene(s) that modify intracellular polycystin-1 trafficking. In conclusion, our study of 209 families revealed that 27.8% of the probands did not have an apparent family history of ADPKD as a result of de novo disease (15.3%), indeterminate family history (10.5%), and positive family history in retrospect (1.9%). Moreover, 16.3% of them had an atypical imaging pattern manifested as asymmetric (11.0%), focal (4.8%), or unilateral (0.5%) disease. By integrating the renal imaging and genetic results with their family history information, we found that PKD without an apparent family history might be due to de novo mutations, missing parental medical records, germline or somatic mosaicism, and mild disease from hypomorphic PKD1 mutations. Of our patients with genetically unresolved cases, those suspected of somatic mosaicism are amenable to improved detection by targeted resequencing, whereas the remaining patients with mild or focal disease should be screened for atypical splice mutations in PKD1 and PKD2 as well as GANAB mutations. We conducted a systematic study to delineate the causes behind the apparent lack of positive family history in patients with suspected ADPKD from the TGESP cohort5 according to a prespecified protocol approved by the institutional review board at the University Health Network in Toronto, Ontario, Canada. All study patients (n=210) previously underwent renal function testing, abdominal imaging, and comprehensive PKD1 and PKD2 mutation screen at a single site in Toronto. From this cohort, we identified all patients with and without an apparent family history, examined their parental medical records, and performed renal imaging in all available parents of unknown disease status. On the basis of the updated data, we classified our families as (1) de novo disease if the patient had ten or more cysts per kidney, but both parents did not each have a total of three kidney cysts, and/or if we identified a mutation in the patient but did not identify it in both of their parents; (2) indeterminate family history if parental medical records or genetic information were unavailable; or (3) positive family history in retrospect if at least one parent had an age-dependent minimal number of cysts for ADPKD according to the unified ultrasound diagnostic criteria or if a pathogenic PKD1 or PKD2 mutation was identified in both the patient and the affected parent. We genotyped ten family members of TOR186 with five polymorphic simple sequence repeat markers at the PKD1 locus. The locations of these markers relative to PKD1 are as follows (the number between markers denotes intermarker distance in centimorgans): HBAP1–2.0-KG8/PKD1-0.8-D16S2618–1.2-D16S423–1.3-D16S2622. KG8 is an intragenic marker located within the 3′ end of PKD1. Genotyping was performed using a published protocol and analyzed by PAGE.25 All genotyping was performed and scored by K.W., who had no knowledge of the clinical status of the study subjects. Paternity testing was performed on DNA samples of the test patients and their parents by genotyping 15 polymorphic tetranucleotide simple sequence repeat markers from the AmpFLSTR Identifiler Kit (Applied Biosystem, Foster City, CA) according to the manufacturer’s instructions and analyzed on capillary electrophoresis. Cloning of PCR amplicons encompassing the PKD1 (c.2605delC; p.R869FS28X) mutation in TOR135 was done using the TOPO TA Cloning Kit (Invitrogen, Carlsbad, CA) according to the manufacturer’s instructions.26 Four microliters PCR products from the mosaic mother and her affected daughter (Figure 4A) were used for the ligation reaction, and the mixture was incubated at room temperature for 10 minutes. Then, 2 μl TOPO Cloning reaction mix was added to One Shot Chemically Competent Escherichia coli and mixed gently. After incubation on ice for 10 minutes, the mixture was heat shocked at 42°C for 30 seconds and transferred to ice immediately; 250 μl SOC medium was added into the vial containing the reaction mix and shaken horizontally at 37°C at 200 rpm for 1 hour. Fifty microliters transformation mix was spread on two prewarmed selective LB plates (containing 100 μg/ml ampicillin with 40 μl 40 mg/ml X-gal) and incubated at 37°C overnight. All white colonies were inoculated on a plate, numbered, and resuspended individually in 50 μl water. After 5 minutes of heating at 95°C and centrifugation, 1 μl supernatant from each colony was added into a final 10-μl PCR reaction using the same PCR conditions, except that the cycle number was reduced to 30. At least 300 randomly chosen clones (with 335-bp DNA inserts) each were screened in the mosaic mother and her affected daughter by SmuI restriction digestion, which yielded four (i.e., 35, 51, 111, and 138 bp) fragments from the wild-type allele and three (i.e., 35, 51, and 249 bp) from the mutant allele, because the latter abolished one restriction site. In patients with no mutations detected, targeted resequencing was performed to screen all of the exons and flanking intronic sequences of PKD1, PKD2, GANAB, and HNF1B for mutation. Libraries were prepared using an NEBNext Ultra DNA Preparation Kit and hybridized to custom capture baits (SureSelect; Agilent Technologies). The enriched libraries were sequenced with 150-bp paired end reads on an Illumina HiSeq 4000. FASTQ files were aligned to the hg19 reference genome (UCSC Genome Browser), and realignment and recalibration were performed with the Genome Analysis Toolkit (GATK). Multisample variant calling was performed with the GATK Haplotype Caller, and variants were filtered with Variant Quality Score Recalibration for both SNVs and indels. Variant mining was performed with Golden Helix SNP & Variation Suite v.8. Large deletions in HNF1B were searched by the copy number variations analysis. In addition, multiplex-dependent probe ligation amplification was performed to detect HNF1B deletions in patients with equivocal CNV analysis results. The diagnosis of ADPKD in the study subjects was confirmed by ultrasound- or MRI-based criteria.7,8 For patients without a positive family history, the diagnosis of ADPKD required the presence of at least ten cysts in each kidney, with both kidneys >13 cm in length. An experienced abdominal radiologist (K.K.) reviewed the renal imaging patterns of all study patients (160 on the basis of MRI or CT scans and 50 by ultrasound) without any knowledge of their clinical and genetic status. The renal image of one patient with congenital single kidney was not analyzed. From this review, the renal imaging pattern of all study patients was classified as typical or atypical for ADPKD. On the basis of cyst distribution and the ratio of right kidney volume (RKV) to left kidney volume (LKV), atypical PKD was reported as (1) asymmetric, (2) unilateral, or (3) focal, similar to the class 2 patterns reported by Irazabal et al.10 Asymmetric PKD was defined using a set of conservative criteria (i.e., diffuse cystic involvement of one or both kidneys with 50% or more difference between RKV and LKV).27 Unilateral disease was defined as unilateral diffuse cystic involvement causing marked enlargement of one kidney with a normal contralateral kidney volume (normal single kidney volume <138 ml in men and <113 ml in women) having, at most, two cysts by MRI. Focal disease was defined as unilateral or bilateral distribution of renal cysts mainly affecting one pole or where five cysts or fewer accounted for 50% or more of TKV (with a difference between RKV and LKV of <50%).23 Ultrasound was used for evaluation of 50 patients without MRI or CT. We defined asymmetric PKD on ultrasound by 50% or larger length difference between the two kidneys. Unilateral PKD was defined as above and was not seen in any of the patients reviewed. Focal disease was defined by the presence of cysts affecting one pole of the kidney with relative sparing of other parts of the same kidney. Continuous variables were reported as mean (95% CI) if normally distributed and median (interquartile range) if not, and discrete variables were reported as percentages. Two-tailed t test for continuous trait and Fisher exact test for discrete traits were used for statistical testing using GraphPad Prism 5.0 (GraphPad Software, La Jolla, CA). We thank all of the study subjects for their participation. This work was supported by Canadian Institutes of Health Research grant MOP 123429 (to A.D.P. and Y.P.) and National Institutes of Health for the Molecular Genetics and Proteomics Core of the Mayo Translational PKD Center grant DK090728 (to P.C.H.). Part of this study was presented at the American Society of Nephrology Kidney Week November 4, 2013 in Atlanta, Georgia. I.-A.I., V.K., and K.W. contributed equally to this work. K.K. and Y.P. are cosenior authors. This article contains supplemental material online at http://jasn.asnjournals.org/lookup/suppl/doi:10.1681/ASN.2016090938/-/DCSupplemental.